My husband isn't one for wearing cologne that often, that is, until we go out for a night on the town. While he doesn't wear it much to the office or while lounging around the house, he always smells great when we paint the town red. Now, I'll admit that while I like the cologne he currently wears, I don't necessarily love it. So when Michael ran out of cologne recently, I wanted to surprise him with the perfect holiday gift for the special man in your life: the Nautica Aqua Rush 4-Piece Gift Set. 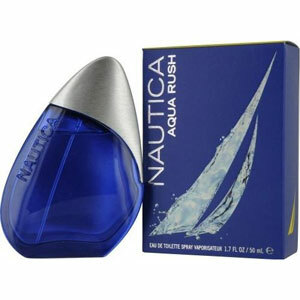 I reviewed the Nautica Aqua Rush 4-Piece Gift Set which retails for $114.00, but is currently on sale for $68.00. Energetic. Confident. Inspired. Nautica Aqua Rush captures the freedom and adventure of the man who is undeniably masculine and appreciates the rush he gets from living life to the fullest. It's formulated with fragrances that derive from the bold, masculine scents of the Sea Breeze Accord, Yuzu and spicy-sweet Corlander and finished with subtle notes of Amberwood , Water Musks, Watermint and Teak Wood. 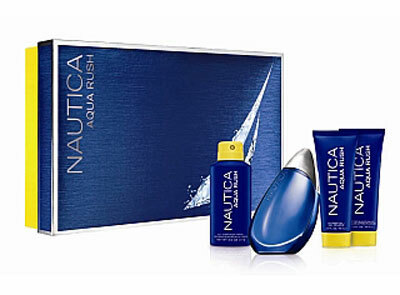 Disclosure: I received the Nautica Aqua Rush 4-Piece Gift Set in order to facilitate my review. No other compensation was received. This product review is based on my own personal experiences with this item and is completely honest and objective. I like the NAC 101 metal watch. Thanks for the chance. Love the Nautex Fleece Jacket. Thanks for a great giveaway! I like the BFD 101 Gold Metal Watch. I like the Poplin Gingham Shirt for my husband. That is a great price for those. I would love to give him a cashmere sweater. I would love to give hubby the Bengal Stripe button down shirt. Thanks for the opportunity! I’d like to get him the Colorblock 1/4 Jersey Pullover. I’d like to get my husband the Schooner Passcase Wallet. It’s very yacht club looking, and then onto the boat store! I like the Nautex Track Jacket for my husband. I like the 1/2 Slip Stitch Sweater.